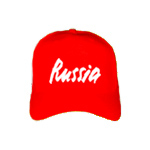 Russia Cap. Wear it anytime you want to keep the sun off or cover up a bad hair day. Cap is originally coming with the fabric of an excellent quality. Cap has multisizes catcher. You will not have problem with size of cap. Here is your cap.